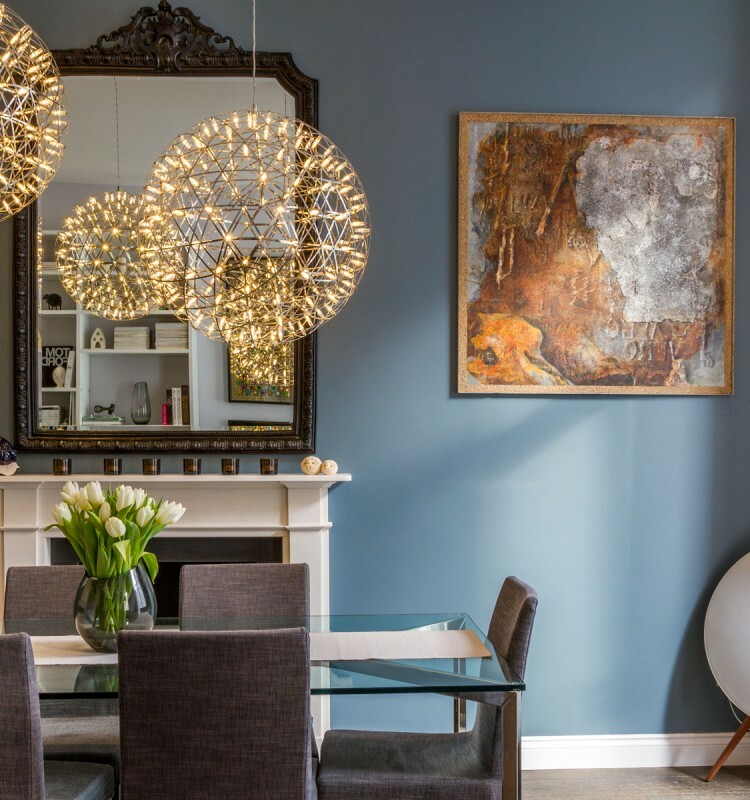 Choosing lighting can be a challenge, but you can bring out the best in each of your rooms with these lighting tips from top decorators. Lighting choices range from dramatic to relaxed, depending on whether the room is formal or casual, urban or rural. Be sure fixtures match the decor—be careful pairing modern with vintage, for example. Consider track lighting to spotlight items such as valued artwork. Table lamps are always a good choice; if table space is limited, consider wall lamps. This is a great place to create a lighting focal point. Choose a fixture that complements the room’s style. 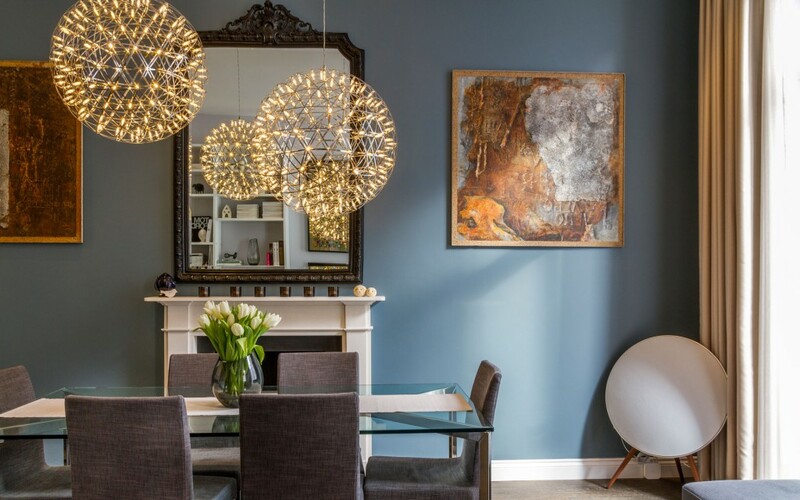 Make sure a chandelier or pendant is 6 to 12 inches smaller than the narrowest side of the dining table, and that the bottom is 30 inches above the surface. In a dining room, 200 to 400 watts is sufficient. If you want more light, try recessed bulbs or wall sconces. Proper lighting reduces eyestrain and increases task effectiveness. Provide a well-lit space but avoid glare. Try desk and floor lamps that adjust, with pivoting heads or movable shades to customize the direction of light. Use the correct intensity: 40 to 60 watts for reading/writing, 60 watts for computer work, and 80-100 watts for attention to detail. Hanging pendants are great above dinettes; mount these at least 18 inches over surfaces. For task areas such as counter tops, use 80 to 100 watts. Under-cabinet lights eliminate shadows and add illumination, as do recessed bulbs over the sink. Consider ceiling-mounted track lights aimed at food preparation and presentation areas. A bathroom should be brightly lit. Wall lights on either side of the mirror eliminate shadows and create a pleasing look. If you can’t manage this, consider a lighted shaving and/or makeup mirror. Use a warm white light and not the harsh cold white of traditional fluorescents. For additional illumination, install recessed bulbs or track lights. For kid’s rooms, create bright spaces that are welcoming for playtime and studying. Position lights to avoid glare on computers and tables. Include a nightlight or low-light settings to comfort little ones at bedtime. For adults, don’t be afraid to take a chance and create drama with a chandelier or pendant; this is especially nice in large bedrooms. For guestrooms, make sure all areas are well-lit and welcoming, and consider a whimsical touch with fixtures in unusual shapes, colours, or patterns. Lighting creates the mood and enhances the function of each room. If you follow these tips, your home will delight both your family and your guests.